This newly-placid Falco certainly echoes the title of his band’s new album. 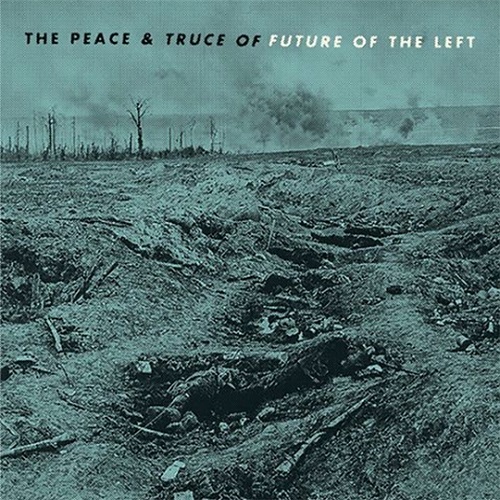 The Peace and Truce of Future of The Left is suggestive of a much more sedate affair than their usual serrated riffola. It’s a relief, then, to discover that FOTL remain as brutal and noisy as ever, with their frontman’s barbed lyricism on devilishly hilarious form as he tears strips from themes such as bourgeois self-entitlement and cultural complacency alongside a host of additional topics, all ripe for ridicule. With cosier concepts such as ‘peace’ and ‘truce’ seeming pretty far from the record’s true essence, we have to ask: what’s with that title? That almost makes it sound like the album itself is a manifesto, we suggest. This meets a skeptical response. The antagonism hasn’t entirely gone away then, we note. Songs like new effort Miner’s Gruel, or Singing of the Bonesaws (from 2013’s How to Stop your Brain in an Accident) even see Falco driving the point home by adopting exaggerated, caricature-esque voices, adding an extra layer to his already performative delivery. It’s almost like character acting. In keeping with Falco’s muse since his time in Mclusky, current musical trends get quite a kicking on The Peace and Truce. This time it’s the turn of ‘serious’ musicians striving for pop music’s singular most worthless fallacy: authenticity, as depicted on The Proper Music. Its author seems to have expanded his thoughts on the subject since writing the album, however. Again, he offers no specific names (“I’ve just had so many problems over the years”), but continues the thought with a different kind of example. 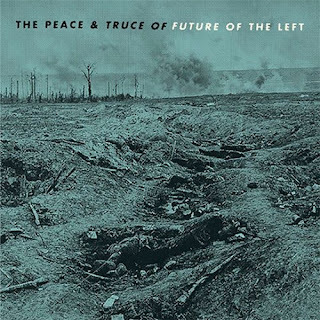 Future of the Left are often pegged as being a political band, although in keeping with Falco’s own irritations, this is an observational tendency rather than a means of hectoring or addressing subjects head-on. “I admire anybody who holds political viewpoints which are contrary to their own interests. For example, the selfishness of a lot of people on the right – ‘I have this money and I’d like to keep it,’ you know? Even though I don’t agree with that, I can understand it. Whereas it’s very easy to be on the left: to earn not much money and to want more for yourself and the people you know. It’s voting essentially with self-interest. So I’m very aware that, with the economic position that I’m in, by default I’m on the left, unless I’m a crazy person. But let’s face it: 98% of the people who come to our shows are gonna be… if not Labour supporters, then certainly not Conservative. That’s true the whole milieu of indie rock. “I remember we [Mclusky] were on tour during the US elections in 2004, and saying a little joke about George W Bush on stage every night. After 22 shows, we finally had one dissenting voice in LA, in all that time. But it’s not that America is 98% behind us, it’s that indie rock clubs are 98% behind us. I mean, it’s unusual, isn’t it, when you see Conservative musicians? I read an interview with Phil Collins which made me feel a little bit sorry [laughs] about things I’ve said onstage about him over the years. I wasn’t even necessarily singling him out; Phil Collins is just a funny collection of words. I could probably think of a more deserving target like Andrew Lloyd Webber; somebody fiercely Tory. The really dangerous figures like Trump and Johnson are already beyond parody. “Well, this is it. How do you parody trump? Johnson’s bloody had a go at doing it himself; let’s face it, that man is far cleverer than he puts across. His bumbling fuckwittery is a tactic to disarm, whereas Trump is amoral. I feel anybody who has an ideology like it’s a religion, or dogma, who only accepts information that confirms what they already know, it’s a sad position to be in. Of course. After all, we’d be wandering dangerously close to singling out individuals if we went down that route. Falco laughs once more. Is that a hint of sarcasm we detect? Surely not. With the peace and truce of God on his side, provided he keeps his levels of bastardry within reason, who could doubt the sincerity of a changed man?